An informative post on ligatures in web type from Elliot. And, oh yeah, he redesigned his site again (it’s unsurprisingly lovely). Richard starts diving into some the nifty ligatures that are becoming available to us in OpenType fonts with CSS3. 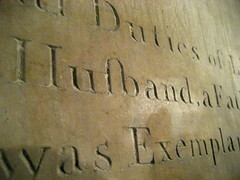 As you can probably tell from the Huffduffer logotype, I like ligatures. Most ligatures are formed by the combination of the lowercase letter f and a subsequent letter—although the gorgeous Mrs Eaves typeface includes a few more unusual ones. 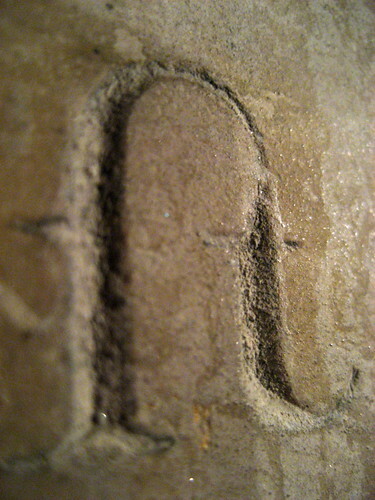 There’s an old letter that looks a lot like the lowercase f and that’s the long s.
Up until the 19th century, this was the default way of writing the letter s at the beginning or in the middle of words. Our letter s—called the short s—was mostly used when a word finished with an s or when an s followed an s (the word Congress on The Declaration of Independence matches both criteria). I was in Warwick last weekend, the day before Richard’s wedding. 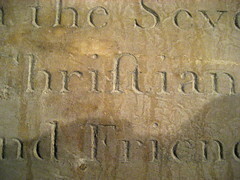 While Jessica and I were exploring the church crypts, I found some ligatures that were new to me. This looks like a regular ft ligature but actually it’s a long s followed by a t—look at the way the crossbar on the long s doesn’t go all the way across the vertical stem like it would on an f. Another dead give-away is the fact that the word being spelled is Christian. 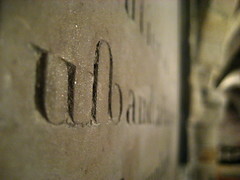 On another headstone I found a ligature formed by the combination of a long s and the letter b, used to spell the word Husband. While there is a corresponding f-based ligature, I can’t remember ever seeing it in the wild. The combination of f and b is rare in the English language. The only examples I can think of are compound words like halfblood or halfbreed ; words more often spelled with a hyphen separating the f and the b. My photographs of the subterranean ligatures didn’t turn out great—my little point’n’shoot camera isn’t very good with low-light conditions—so I whipped out my sketchbook, put a page in front of the letters and recorded some pencil rubbings for posterity.